I've been out with the head tourch again. 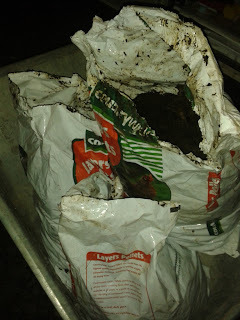 10 bags of well rotted horse muck spread on my summer fruiting raspberries and blueberries. Shame I did it at 10 at night. I think my wife thinks I'm nuts. I'll get some more tomorrow and do the same! I had tried raspberries and blueberries several years ago. They promptly died..... But I tried raspberries again last year, they are doing well so far...so I picked up five large blueberry bushes a couple weeks ago. I have learned for here as with so many other plants... just keep them protected from the 110 degree afternoon sun! They do not like that! The blueberries really need an acid soil as well or they wont do very well. I've got mine in a raised bed with some ericaous compost in. Raspberries just seem really hungry - give them plenty of muck and they seem happy! We are trying lunar planting this year..good God we're desperate for a good crop! Put some donated raspberry canes in four days ago and the *****chickens have pulled them back up again. I think the geese have also had a go at nibbling on the new leaves which some of them did have. Nothing for it - shoot those chickens! No, I don't mean that, really I don't. I don't think you are nuts at all. You are a gardening person doing gardeny things whenever time permits, or rather a homesteader doing what homesteaders do whatever time of the day or night it needs to be done! I think that sums it up really. I could just sit inside and watch TV like most people do but I want to do things rather than watch people do things! I've been brought up like this as well. My parents and my brother and sister are all the same. On a Sunday dad will ring up and ask what I've been doing. If I say "nothing" then I feel guilty!